I’m pretty sure all of us would relish an opportunity to see what’s really inside everything we are planning to eat. This would surely help us in planning out a better diet for ourselves and our family. Before eating anything, you could pick up your iPhone, iPad or iPod and check the composition of your food. Well this is what you’ll get if you download Fooducate which is basically a diet tracker and healthy food nutrition scanner. If you’ve got this app with you, you could really get an opportunity to know whether you’ll put on weight if you eat something or not. So basically you get an opportunity to only healthy food according to your choice. This is the best food rating for anyone who is trying to lose weight effectively. As planning your diet is one of the most important aspect to weight loss, you can efficiently do it using Fooducate. This app has a very big database with over 200,000 unique products and growing. So basically anything you find in a restaurant or wall mart would be there in this app. Many of you might have the idea that the way to easy weight loss is by eating less food but I would tell you that the best way to easy weight loss is by eating healthy good food in the right quantity and in order to do that you need a diet tracker and a nutrition scanner. Every item you see there is labelled with a grade which is supported by reviews from dieticians and other users, so that you can easily know which food to avoid and which not to. All the items are graded from A to D. The app also allows you to learn about a products advantages and disadvantages which will help you in adopting healthier alternatives. I’m pretty sure you can find many other nutrition and diet tracking apps in the market but not all of them are even half as good as this one especially because many of them don’t have the option to add your own foods to track your progress. The app also allows you to create a healthy shopping list and even submit a new product for analysis. Maybe you haven’t noticed but many of the products hide things which will make you think twice about buying the product such as excessive sugar, controversial food colouring, tricky Trans fats and a lot more. 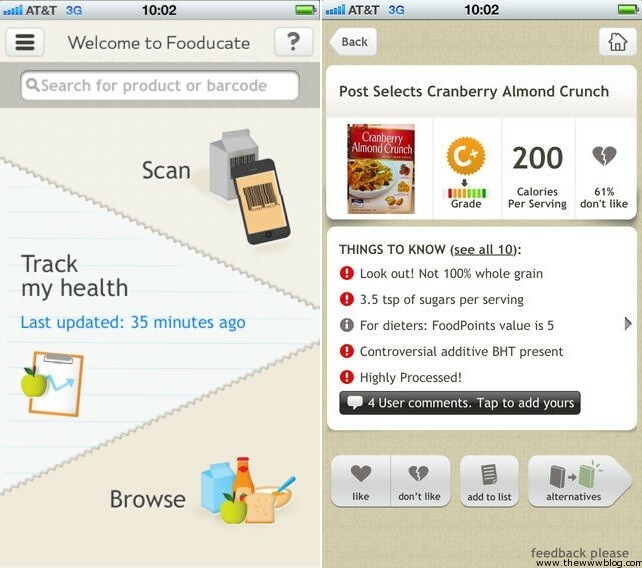 I think you can make the best use of this app while shopping because whenever you go shopping you could pick something and scan it and Fooducate will tell you everything about it so that you can make the right diet choices. Since it’s a free app, I don’t think there is anything wrong in checking the app out and I’m pretty sure you’ll adore it just like I did. Check out the Fiocracy app review and the best Entertainment apps for the iPhone, and some of the best games for iPad as well as for the iPad Mini.